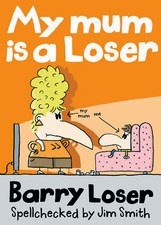 Title: My Mum Is A Loser. In a nut shell, this book wasn't what I was expecting. Characters: Great creations, perhaps i'm just too old to appreciate younger kids books that make references to dog poo and snow, maybe it was that I had to read it 8 times in one night to the kid I was baby sitting who new every word, that kind of does it for you. Plot; yeah that was good. The kids love it, that's all that matters. Even if I did have to explain Hailstones every time we read this, and how it was possible for chips to look like lightening. It can drive a girl to madness. But the pictures were a little funnier, maybe its my dirty mind but on page 23 I had a laugh, even if they kids had no idea what i found so funny. Spoilers: This book is about a kid, telling the story of his mum, and her tea towel.